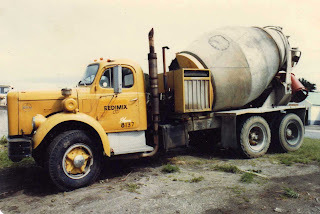 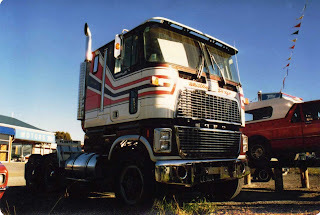 Here is a mixed bag of truck photos of all sorts of makes and types. 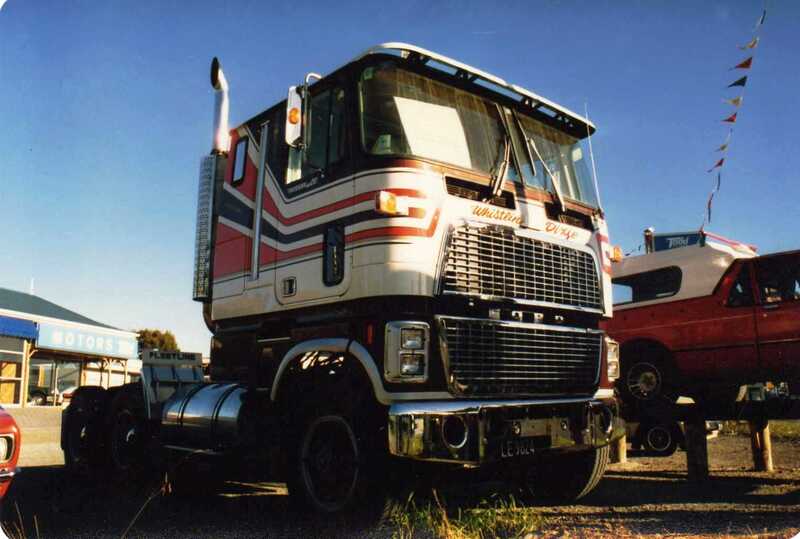 When NZ was competing in the America's Cup yachting races, a hull of one of the race boats did a promotional tour throughout the country behind this Mack Superliner. 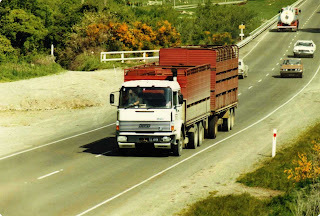 Foley's Transport's 1983 Fiat 190 F38 approaches Ashhurst after coming through the Manawatu Gorge. 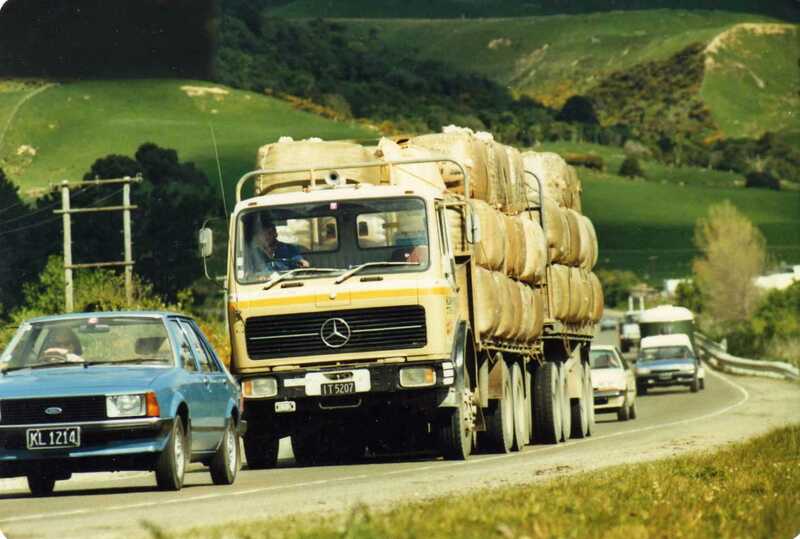 Taken at the same place as the above photo, but down at road level, is this1978 Mercedes Benz 2632 and4 axle trailer with a load of baled wool. 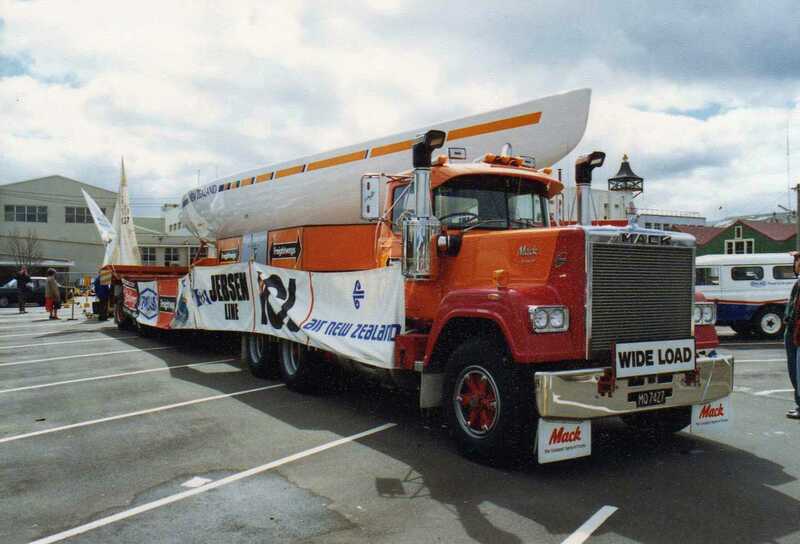 "Whistlin' Dixie" was NZs only Ford CL9000. 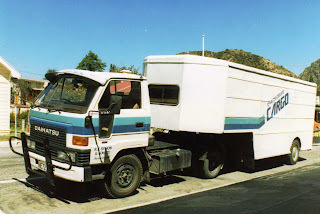 I don't know where she is now. 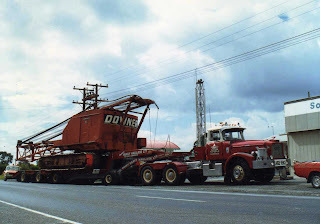 Waikato Heavy Haulage operated this 1971 Scammell Contractor, seen here hauling a drag-line rig in the far North of the North Island. A Daihatsu articulated unit hauling cargo for Air New Zealand. 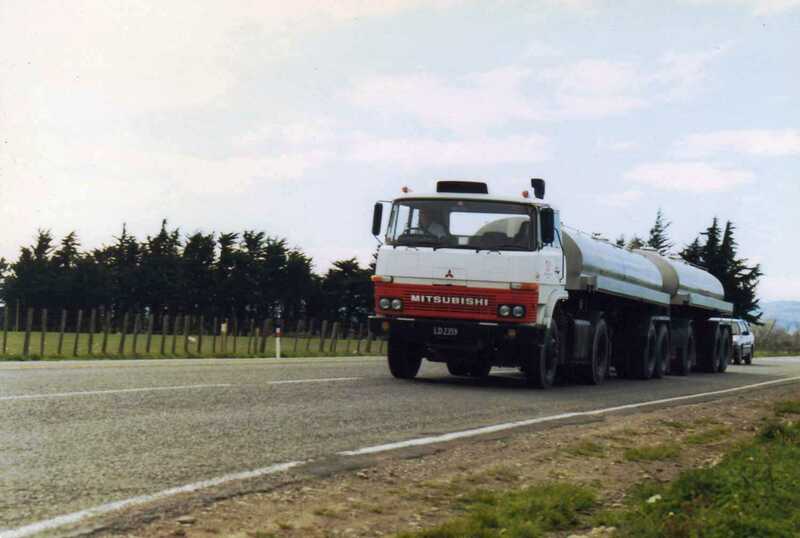 Milk tankers in NZ now are mostly 4 axle rigids towing 4 axle trailers, but previous to this they were mostly seen in A-train configuration like this 1983 Mitsubishi FP315JR. 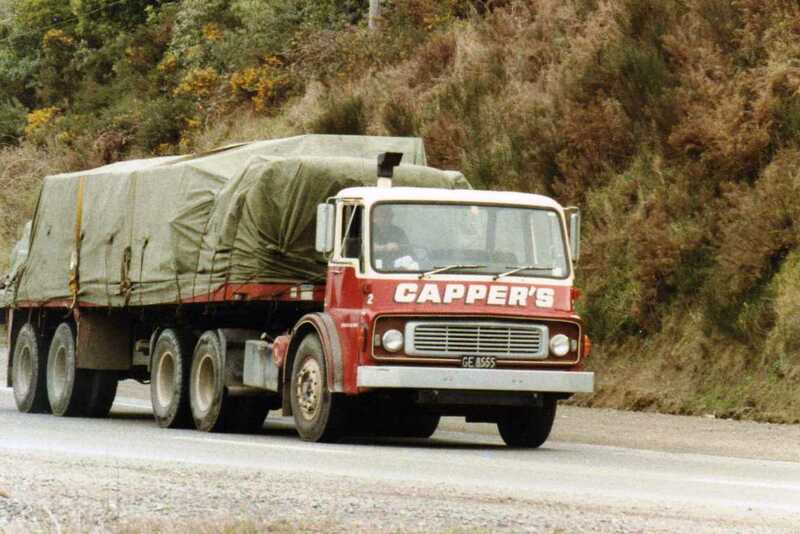 Can't you just here the V8 Perkins winding up as this Dodge makes a run at the steep climb up Haywards, north of Wellington. 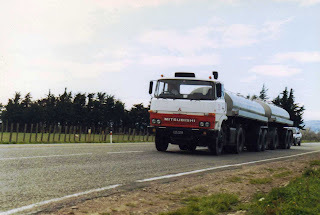 I spotted this old White Mixer near Patea in Taranaki on the Western side of the North Island. 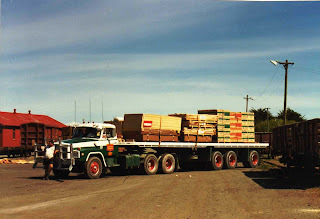 A load of what looks like wall board tests the strength of the trailer of this Transport Wairarapa Nissan Jumbo in the rail yards at Masterton, while the driver tests the strength of the bull-bar. 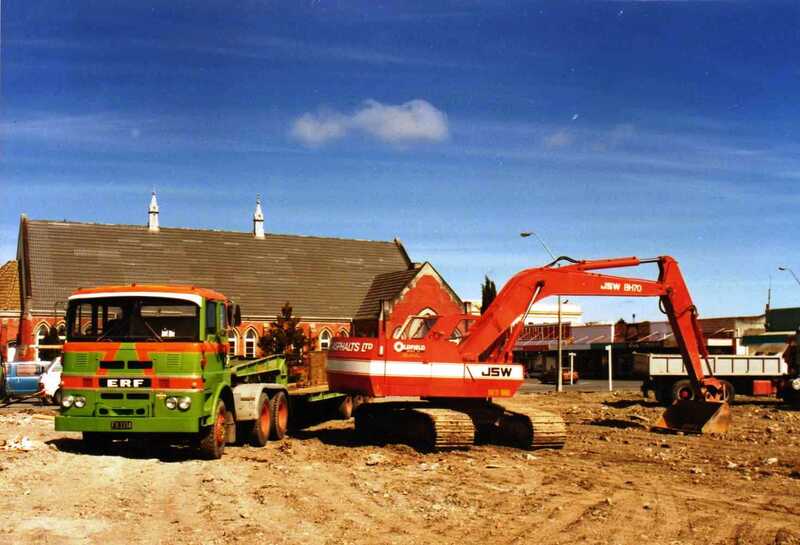 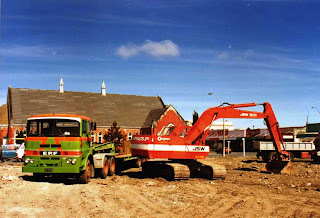 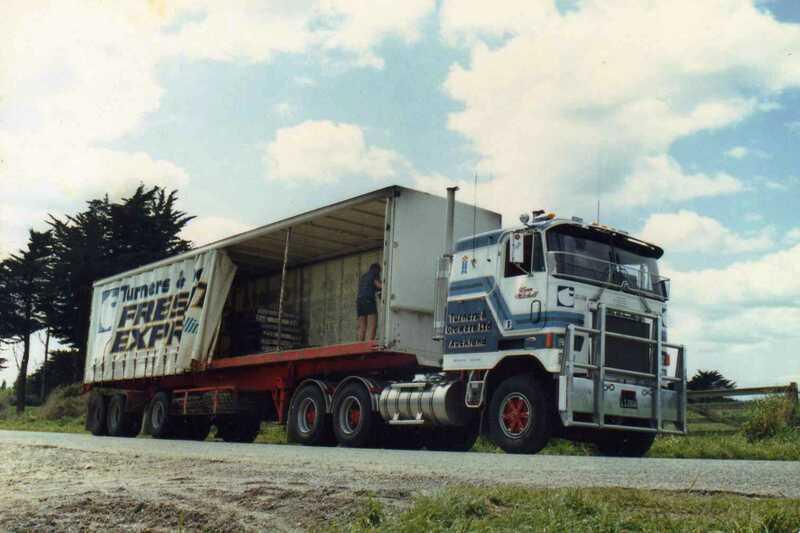 An ERF with the Motor Panels cab is parked at a new supermarket development in Masterton. A narrow cab TM Bedford unloads on the "wrong" side of the road in Chapel street in Masterton. 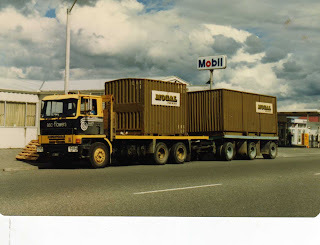 In one of my other blogs I showed one of the Oshkosh tow trucks that moved the components for the Motonui synthetic petrol plant. They also had these Clark loaders with road tyres and "push" plates up front to push the trailers that the Oshkoshes were towing. 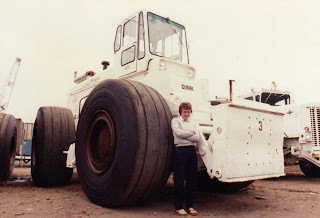 My wife is holding it still for the photo. 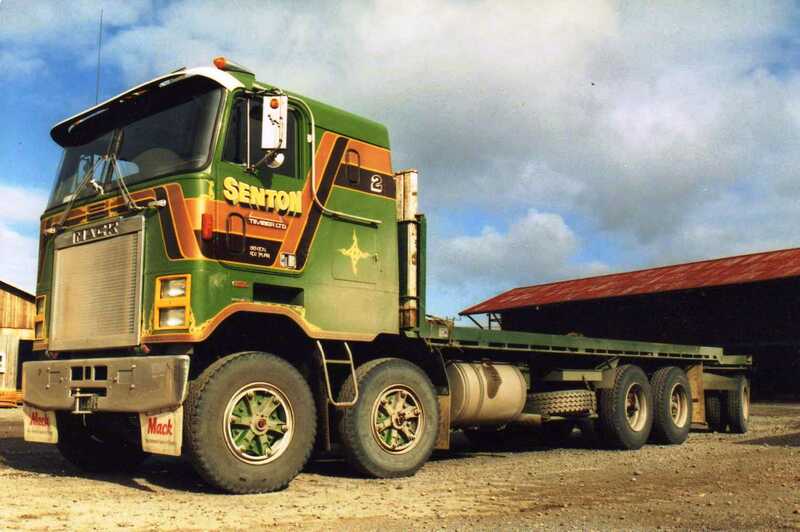 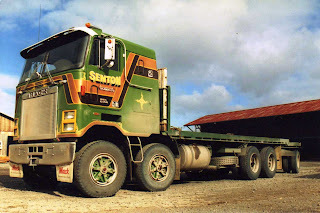 Senton Timber's 1984 Mack R722 RST Cruise-Liner awaits a load at Daniell's Mill in Masterton. 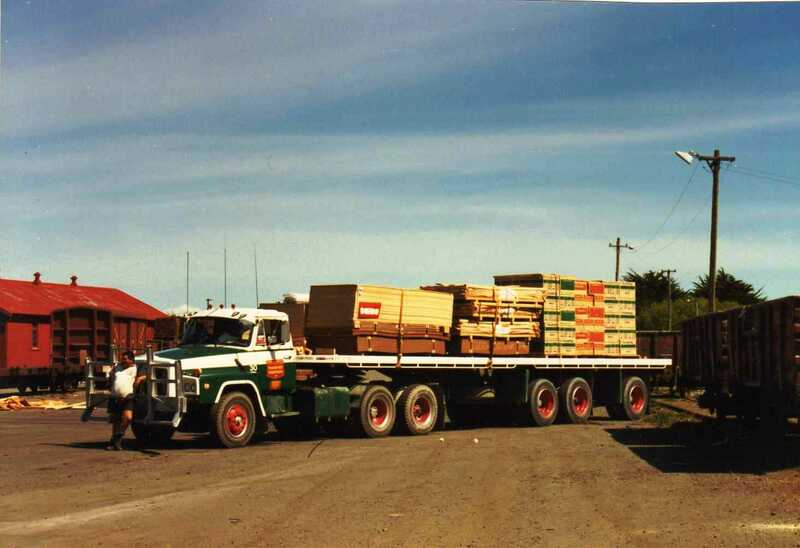 Wynn Mitchell was an owner driver, carting produce for Turners and Growers with this Mack Cruise-Liner. 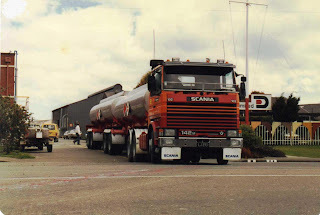 A chemical tanker B-train exits Dulux Paints yard at Seaview, pulled by a Freightways Scania R142M of 1983 vintage. 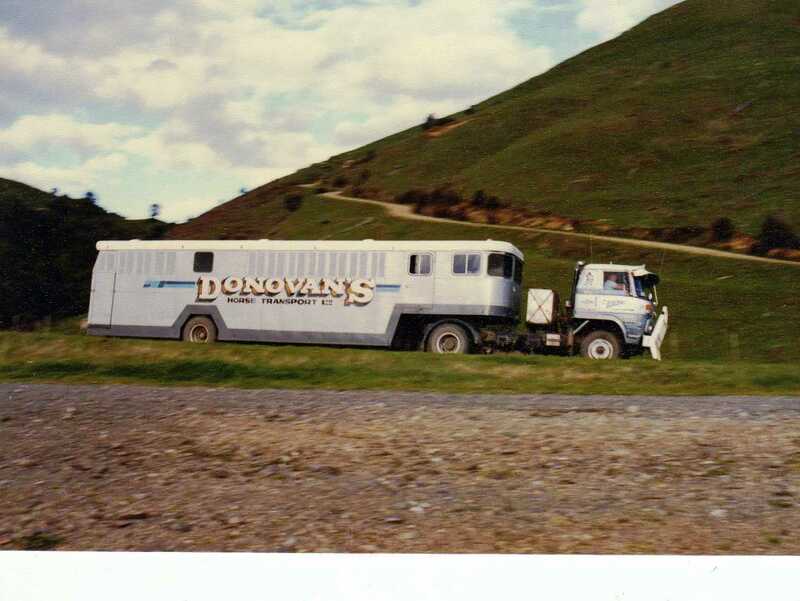 Donovan's no longer exists, but they operated a horse transport service for many years from their base in Masterton. 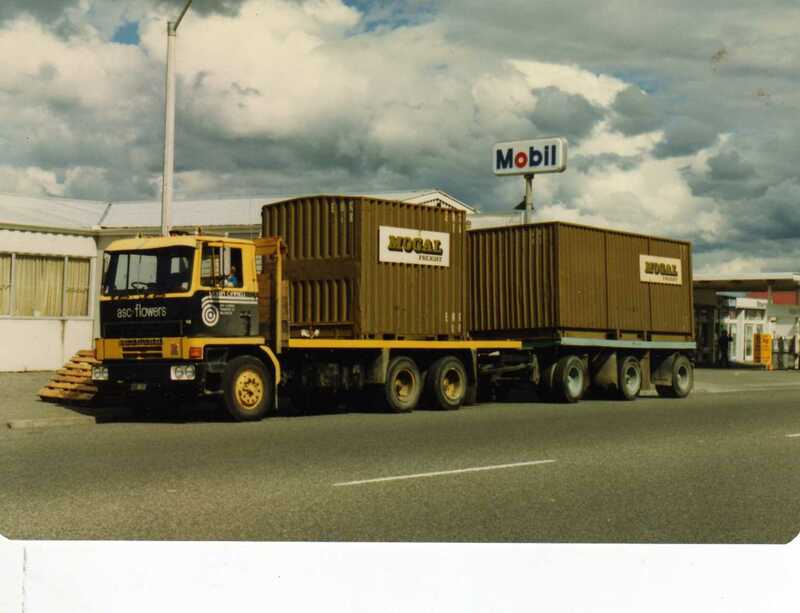 Here their Isuzu rig descends Mount Bruce heading to home base.